The Road to Hawaii, or how we sold (almost) everything, quit our jobs and moved to Oahu, as told by one family who is experiencing it. 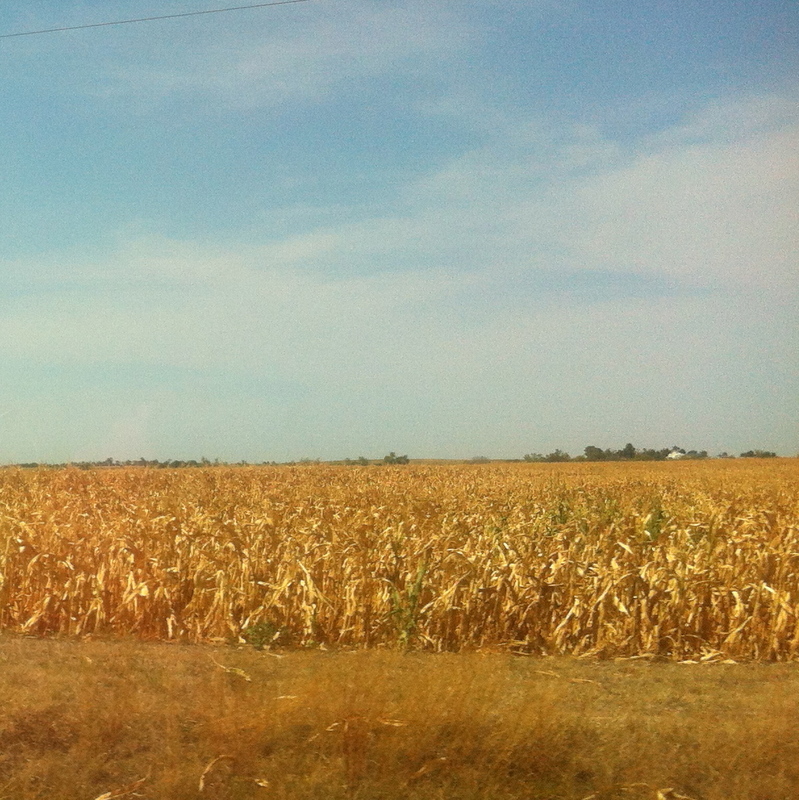 We drive through more flat farmland, the corn brown, its leaves curled in protective cones. Corn should not be this brown, not in August, but the drought has taken its toll. The further west we go, the more burned the landscape. We cross the Indiana, Mississippi and Kansas Rivers, the water low. Creeks and smaller rivers are dry. We stop at Hannibal, MO, boyhood home of Mark Twain. It’s a sleepy town, caught in time, the edges sharpened a little by commercialism. Benches line the sidewalks, which are cobblestone in places. We stand on the shores of the Mississippi to say we have, then climb in the car and hit the road to Hawaii again. Awake at 4:30, too keyed up to sleep. After an early breakfast at Denny’s, we finished packing, purging and planning. One last trip to Goodwill and two to the post office. I think there are 3-4 boxes left. The car is groaning with the detritus of our Michigan life. I’ll have to purge more before we board our flight to Honolulu in ten days. Dozens of forms later, we are officially homeless. It takes another two hours before the buyers finish their paperwork, then we pick up our check, only to discover their title company has included the realtor’s check in the same envelope! We backtrack from the credit union to our title company and deliver their part of the sale. 8-10-12 @ 3:39 p.m. our new life begins. It rains all the way to the Michigan-Indiana border. Our GPS, “Maggie” is a little outdated, so we’re on the toll road for a mile, scrambling for sixty cents, our wallets empty of coins (except Canadian) because we went to the laundromat the night before and dumped the rest of our change at CoinStar. South of Chicago on I-55, the land is flat, we can see for miles, little towns in the distance beckoning travelers. We pass a windfarm that goes on for miles, hundreds of blades turning lazily from the evening breeze, their movement hypnotic. Further down the road, gentle hills rise, and we catch sight of more blades dotting the horizon. We stop for the night in McLaren, north of Springfield, home of Lincoln. Tonight we sleep in Kansas. After we returned from Chicago yesterday, where we saw “H” and “A” off for their trip to Vegas/Honolulu, I called Matson Shipping to arrange the shipment of our car. I picked Wednesday, August 22nd, their regularly scheduled Wednesday departure from Long Beach to Honolulu. We could drop off the car anytime before then. Wednesday. Remember this, it’s important. Sometime later, I signed onto Hawaiian Airlines and looked at their calendar for the best rates, which turned out to be Monday the 20th and Tuesday the 21st. I got all excited because the 20th is “H’s” birthday. What a nice birthday gift if we could arrive at our new home on her birthday. All caught up in the thought, I reserved two seats at 10:40 a.m. Monday. Remember, it’s important. Did I mention that Matson is only open from 8:00-4:00 Monday-Friday? It took about a half hour for it to sink in. No way could we drop off the car and make LAX in time. Sure, it’s only 21 miles away (via Yahoo maps) but what if there’s a delay? Or traffic? Or the zombie apocalypse? (I doubt if we will be attacked, but let’s not stack the odds in their favor). New plan, which I’m sure has flaws: Leave here tomorrow (Friday), drive cross country to Long Beach in time to drop off the car next Friday. Rent a car and bum around somewhere until our flight on Monday morning. Tentative plans are to zip up to Vegas for the weekend, returning to LA Sunday night. That’s what happens when you’re in a rush. On the bright side, the house is clean, everything is boxed, the pantry, refrigerator and freezer are empty (don’t look at the 12 bags of garbage in the garage). We’ve been to the post office three times in two days and Goodwill three times. There are 9 boxes yet to be mailed. We won’t speak of the shipping costs. Cheaper than buying it there, right? The only thing I have to do is pack clothes. We have a box of goodies to eat on the way. Tonight we go to the laundromat and do one (or two) last loads before last minute running around tomorrow morning. At last, we’re on the way down the road to Hawaii. Aloha!